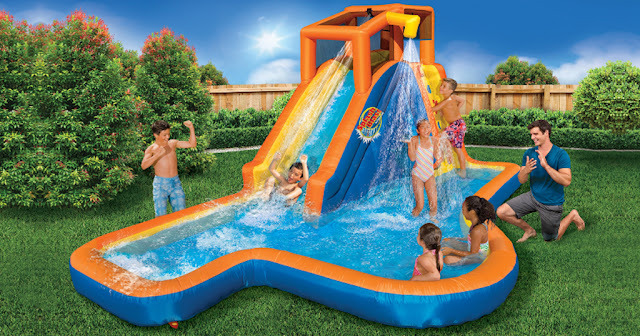 Today, July 10th only, head over to Kohl's where you can score this Banzai Slide 'N Soak Splash Park for just $249.99 shipped (Retail $599.99). Even better, sign up for Kohl's Mobile Sale Alerts by texting SAVE07 to 56457 and you'll score a unique discount code valid for 15% off your online purchase. If you are already receiving Kohl's text offers, you can try first texting STOP to 56457 and then text SAVE07 to 56457. PLUS, today July 10th only, you'll get $15 in Kohl's Cash for every $50 you spend. This Kohl's Cash will be redeemable July 13th through July 18th. *You may be able to score $5 in Kohl's cash if you choose free in-store pick up if available near you! Your $5 Kohl's Cash will be sent in your pickup confirmation email AFTER you have physically picked your order up from the store, and it can be used right away! For more information, go here.